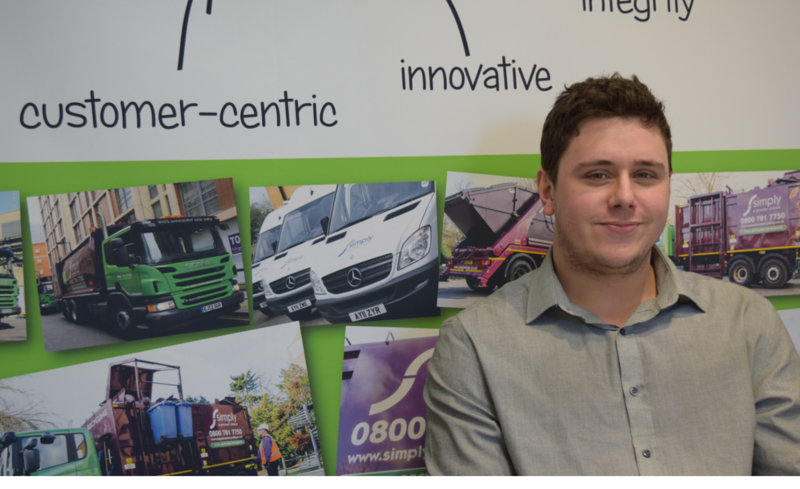 Simply Waste Solutions has appointed its first Digital Manager. This reflects the growing need for us as a business to manage our use of current and emerging technology as we continue to grow. Technology is an integral part of what we do and will become increasingly important to fuel our growth. We have always prided ourselves on taking an innovative approach to waste management and this role represents our commitment to ensuring that technology best serves us and as a result, our customers. This role was a natural progression for our Digital Marketing Executive. We believe in promoting internally throughout the business. This recent promotion has opened up the previous position to give someone else the chance to grow and learn with Simply Waste, or someone internal to have a change of career. We asked our Digital Manager about his time and progression at Simply Waste. How long have you been at Simply Waste? I started with Simply Waste over two and a half years ago. What’s your progression been in that time? When I started I had the position of Accounts Assistant, where I would assist with purchase ledger duties. Three months into this role my flare for creativity and enthusiasm for technology brought me over to the marketing side of the business as a Digital Marketing Executive. When I started in marketing I was responsible for our customer reports and managed our social media channels. With the growing success of Simply Waste, reporting for customers became a heftier task. In lieu of this I decided to automate and write scripts to assist my reporting efforts. After a few months I was able to direct my attention to my marketing duties, running PPC campaigns, creating and editing video, developing content for the website and even building an intranet system for our drivers and office staff. How is your new role different from your previous? I am now responsible for overseeing emerging technologies that could benefit the business and will be managing a small digital marketing team. One of the tasks I am getting involved in already is ensuring that we follow the GDPR regulations that affect our business digitally. As I studied IT in university, a digital management role is right up my street and I am looking forward to the various tasks the role entails. What do you like most about working with Simply Waste? Simply Waste is a great company to work with, they really focus on their employee’s development and opportunities to further their career is in arms reach. I like that I have a varied scope of work, meaning that no two days are the same and I’m never able to rest on my laurels. What are you looking for in your new recruit? At this time, we are looking to hire somebody to fill the position of Digital Marketing Executive who will effectively continue my previous role after a period of training. I believe the best candidate would be someone who has some knowledge of marketing either through work or study that will pick up our marketing strategies in a short time. In addition an understanding of website development and design would be beneficial to the department. For us digital goes far beyond our website and social media channels. It covers the back office functions, including call management and live service updates from our drivers PDAs and creating a better customer journey. The marketing department is a fast paced and growing area of the business. If you would like to apply for the role of Digital Marketing Executive, you can check out the job description and apply by following this link.